A useful app, and we'd strongly recommend trying it out to see how well you get on with it. Good single note tracking. Can track different right-hand techniques. Performance suffers with humbucker instruments. Not completely accurate. Latency could be better. Plug your guitar into your iDevice, run this app, and it converts what you play into polyphonic, velocity-sensitive MIDI in real time. 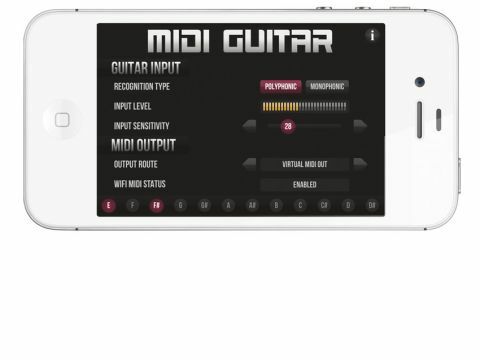 The app itself is free, but a £2.99 in-app purchase is needed to make it useful, unlocking Virtual MIDI (for driving other iOS apps), Wi-Fi MIDI (best with a low-latency ad-hoc network) and MIDI cable output. Conversion latency is OK, though still off-putting during faster parts. Tracking of single-note lines is good, but with chords, notes were sometimes missed or cut off prematurely. For best results, you need super-clean playing technique, and even then, the MIDI will not always be a laser-accurate transcription (and using a humbucker pickup seems to really mess up the tracking). While not quite the flawless MIDI guitar nirvana seen in Jam Origin's promo video, to MIDI Guitar's credit, it handles picked, fingerstyle and legato playing, and any spurious notes are usually at least related to what you played.